The story of glass in Perth begins in the early 19th century with the bookseller and printer, David Morison (1792-1855), who set up the Perth Ink Manufactory in Charterhouse Lane, and John Todd (? - 1865) who owned a bottle works in Loretto Court, South Street, Perth, where he produced ink bottles and presumably other varieties. 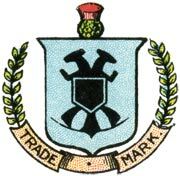 In 1836, the Perth Ink Manufactory was bought out by John Todd & Co., and renamed ‘Perth Ink Works’. They became one of the world’s best known ink-makers with their “Perth Office Ink”. At some later time John Todd & Co. was renamed John Todd & Sons. In 1850, the Tay Glass Works, Shore Road, Perth, was founded by Enoch Tomey who may have had some connection with the English glassworks, Joseph Tomey & Sons of Birmingham. The company specialized in the manufacture of gauge glass, which was used in steam engines and other equipment to give visual indication of the levels of water or other liquids. In 1834, John Moncrieff was born to Agnes and Thomas Moncrieff, at Cherrybank, Perth. He attended the village school until he was 13 years old, when he got his first job at the Perth Ink Works (1847), owned by John Todd & Co. He continued his education at night school. In 1855, at the age of 21, he was appointed manager of Todd’s glassworks, where he remained until John Todd’s death in 1865. While at Todd’s, John Moncrieff proved to be a very practical man (according to his obituary) taking on the job of building furnaces and experimenting with the glass being produced. Following the death of John Todd, he decided to set up his own glassworks, initially naming it the North British Glass and Ink Works, which he opened in 1868 at 189 South Street, Perth. These premises were rented and, according to the 1871 census records, five men and 13 boys were employed in the manufacture of ink and glass. The company remained at South Street until 1881 when a new facility was set up on two acres of land at St. Catherine’s Road. The 1881 census reports that 24 men, five women, 19 boys and four girls were employed. In 1896, a further 32-acre parcel of land was leased from the Council at the lower harbour. In addition to his work, John Moncrieff was active in the local community, giving both time and money for the benefit of the City of Perth. He was a member of the Perth Liberal Club and eventually became Vice President of both the Perth Liberal Club and the Perth Liberal Association. As well, he served on the Perth Town Council for five years and as a member of the School Board for 12 years. He belonged to the Evangelical Union Church and ultimately became the Manager and President. As an advocate of temperance, he became President of the Perth Gospel Temperance Society. Yet even these did not fully occupy him. In addition, he held the position of President of the Perth Bowling Club, and was a Director of the Perth Bible Society. A keen fisher, he belonged to the Tay Fishing Syndicate, and presumably glass target ball shooting fell into his list of activities. He married Christina Robb (born 1851) on 6th June, 1867, and was later referred to as ‘John Robb’, possibly to avoid confusion with his youngest son. He died of a heart attack on September 30th, 1899, and was survived by his wife and three children: Thomas Robb Moncrieff (born 6th August, 1869), Winifred Catherine Moncrieff (born 26th September, 1871) and John “Jack” Moncrieff (born 1st June, 1874, died 29th April, 1950) who took over as Managing Director of the company after his father’s death. 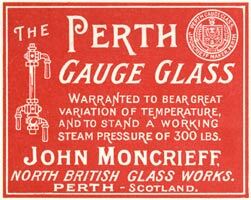 The superior quality of Moncrieff’s products earned the company an international reputation and its gauge glasses, marketed under the brand names ‘Perth’ and ‘Unific’ were sought world-wide by locomotive companies, steamship companies and the British and foreign Navies. This leadership was recognized in 1876 with award of the first of many medals at international trade exhibitions. Moncrieff’s had awarded the sole selling rights for the United States to H.A. Rogers in 1872; this was continued by his successors until 1925 when the assets and goodwill of the H.A. Rogers Co. was acquired by Jenkins Brothers. The business then being conducted under the name Jenkins Bros. Moncrieff-Rogers Division. In 1900, under the management of John Moncrieff, junior, the company acquired the ink production division of John Todd & Co. The glass side of Todd’s was sold to Patrick McNeill, a Perth bottle manufacturer, who carried on business as Gibson & McNeill for only another two to three years. In 1905, Moncrieff’s became a limited company. Between 1915 and 1919, following the outbreak of World War I, the company constructed three new furnaces at the St. Catherine’s Road site. 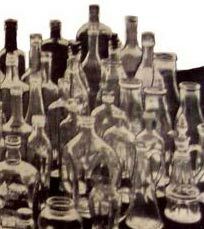 The War effort meant new challenges for the British glass industry, which had depended on imports, mostly from Germany and Bohemia, to fulfill its laboratory glassware requirements. More had to be produced domestically and Moncrieff’s readily met that challenge. In 1919 they acquired Tomey’s Glass Works, which had been operated by Enoch’s two sons, Enoch Joseph and William, since their father’s death in 1867. Although Todd’s and Tomey’s continued to trade under their own names, Moncrieff’s had now become the only producer of glass in Perth. In 1920, John Moncrieff received the O.B.E., in recognition of the contribution by Moncrieff’s Glassworks to the development of the laboratory glass industry in Britain. The company supplied laboratory glassware to British Government departments, factories, hospitals, universities and schools. As a result of continuing research and development of the Moncrieff range of glassware, a new product was introduced in 1926, called Monax. This is a borosilicate glass with great stability and strength; it is resistant to both acids and alkalies and can withstand sudden and extreme temperature changes. A further development occurred at Moncrieff’s in the 1920’s after the cessation of hand production of mould-made bottles in 1926. During the 19th century, machinery to mass produce glass bottles had been pioneered in the United States and Alexander McNish of the U.S. worked with Moncrieff’s to design small-scale automatic bottle making machinery. The resulting machines were called Monish – a blending of the Moncrieff and McNish names. The Monish Glass Machine Co. was established to start production, and the first Monish machine was installed in 1926 at the Tomey’s glassworks premises. This represented significant progress and leadership in the production of glass bottles. In keeping with its commitment to diversification, Moncrieff’s began exhibiting a new line of coloured glass called ‘Domestic and Fancy Glassware’ at the British Industries Fair in 1919. And in 1924, also at the British Industries Fair in London, a line of art glass called ‘Monart Ware’ was exhibited. This Scottish art glassware was the creation of John Moncrieff’s wife, Isobel, and Salvadore Ysart, a Spanish glassblower who had been hired by Moncrieff’s in 1922 to make laboratory glass, with his son Paul as apprentice. Salvador Ysart and his four sons (Paul, Augustine, Vincent, and Antoine) were destined to leave a momentous legacy within the Scottish art glass industry. (Link to article on “Monart Glass”) The production of Monart glassware ceased when Paul Ysart left Moncrieff’s in 1963 to join Caithness Glass as Training Officer and Technical Advisor. John Moncrieff died on April 29th, 1950 and by 1951 control of the company had passed to David Bennie and Sons of Glasgow. It continued to prosper into the 1970’s but changed ownership a number of times during the 1980’s and 90’s. In the 80’s and early 90’s, the company was supplying flat gauge glass made from Monax borosilicate, labeled “Macbeth Brand” to the Corning Glass Company in the United States. In 1992, the company was bought from receivership by Fuller Investments, chaired by Christopher Lattila-Campbell and the name was changed to “Monax”. Mr. Campbell’s wife, like Mrs. Moncrieff before her, was interested in the art glass side of the business and did develop some innovative uses for old stocks of lab ware, milk jars, etc. She toured craft fairs with these products. The last piece of glass made in the Perth factory left the end of the Lehr on December 21, 1995 and the plant was closed down in January, 1996. Even then its work was continued by Monax Glass, Spectraglass and in the year 2000 the company name of John Moncrieff Ltd., was re-established, with a mission of developing to its previous glory. This company carries on business in Dunfermline, Fife, producing art glass, paperweights, gauge/sight glasses, circular sight glasses, tubular gauge glass, and other glass products. In the early years, the company grew with the steam engine, developing tubular gauge glasses to suit increasing boiler pressures. These were sold to every company running steam locomotives in the then British Empire, and were known in every country on the planet. In the USA, they were known as “Scotch gauge glass”. As for the “Unific” brand gauge glass (with a blue label), it was made from Monax borosilicate glass, in a variety of diameters, normally 3/8" – 1/2" – 5/8" – 3/4" — but anything from ¼" (6mm) – 1" (25mm) and equivalent metric sizes for Europe. Lengths were anywhere between 3" (76mm) and 48" (122cm). Usually for the boilers it was between 9" (23cm) and 18" (46cm), with longer lengths being used as tank contents gauges at low pressures. The “Perth” brand was also made in these diameters and lengths. Other names were used for gauge glass (e.g. Monamel, Monax) and Trademark Registration documents used by Moncrieff’s could be researched in this regard, although it would be very time-consuming to do so. Various other types of tubing were made in soda, borosilicate, and aluminosilicate glass, mostly for test tubes and manipulated laboratory ware. In the period 1962-1996, when Colin Mayor was with Moncrieff’s, only borosilicate tubing was made. It is possible, but unlikely, that “Monax” was registered in the USA as a name for Moncrieff’s borosilicate However, Moncrieff’s did not license the melting of it to any other company. Monax was also a US trade name owned by MacBeth Evans Co and used initially for lamp shades and later for a range of opaque white tableware – after take over by Corning, this tableware continued in production. As a rule, tubing finished at the factory would be cut to length on a machine, the ends fused (flame polished) and sandblasted (not etched) with the company name and brand name. It was hand-drawn in lengths of up to 150 feet (46 metres), then gauged and cut into convenient 6 ft. (183cm) lengths. These were shipped to Agents around the world, who would then cut them to order, usually in non-standard lengths, using one of the cutters made by Moncrieff’s. It is known that in 1872 Moncrieff’s awarded sole distribution rights for the United States to a Mr. H.A. Rogers; this was continued by his successors until 1925 when the assets and goodwill of the H.A. Rogers Co. were acquired by Jenkins Brothers of Bridgeport, Connecticut and conducted business under the name of Jenkins Bros. Moncrieff-Rogers Division. It remains unclear what happened to Jenkins but at some point the sale (1950/60’s) of Moncrieff gauge glass was through Corning. Up until World War I, nearly all chemical and laboratory glassware had been imported from Germany. However, with the breakout of hostilities, Moncrieff’s was contracted, in 1914, by the British Government to produce a complete a range of products to fill the gap (around 3,000 different items) and continued to produce these in an ever-shrinking range until the factory ceased all production in January, 1996. By this time, Corning had an interest in Jobling’s at Sunderland and were producing Pyrex beakers etc. by automated machinery. As well, low-priced imports, principally from Czechoslovakia (Czech Republic) had made hand-blown laboratory glassware totally uneconomic. Jack Lavety who used Monax laboratory ware remembers: Interestingly, I have accidentally broken quite a number of pieces of Moncrieff glassware. I worked in a Ministry of Agriculture Torry Research Station laboratory and we used Monax ware because it was cheaper than the ubiqitous Pyrex. Unfortunately, it was much thinner and breakage rates were horrendous. Liquid level gauges continued to be developed by Moncrieff’s to meet the very high pressure and temperature requirements of the modern petrochemical and nuclear industries, and during the 1980’s and early 1990’s made all of flat gauge glasses for the Corning Glass Company in New York State, U.S.A., branded with the Corning trade name (Monax had to be given a Pyrex number to satisfy US trade politics). These gauge glasses were made from “Monax” borosilicate and labeled “Macbeth Brand”. After the Moncrieff factory closed in Perth, Corning purchased these from T.G.I. Ilmenau in Germany, and had them branded ‘Macbeth’. 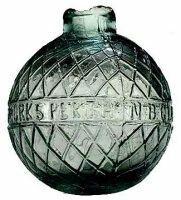 Moncrieff’s was a prolific producer of glass for the target balls used in shotgun competitions, a sport that started around 1830 with live targets, usually pigeons released from traps. In the United States, the first recorded date for use of glass target balls was 1866 in Boston by a Charles Portlock, with competitions beginning in 1867. But the sport did not become popular until Bogardus invented a trap that could throw the ball to heights of 60 feet (19.5 metres). Bogardus patented some ball designs in 1877. It is not known when Moncrieff’s started to make these balls, but an article in the ‘Hundred Years Ago’ section of the Perthshire Advertiser, February 1st 1982, states: The annual glass ball shooting competition took place at Harrietfield, near Perth, on Saturday. Consequently, it is likely that the balls were being supplied by Moncrieff’s in 1882. Target balls were hand blown into a three-part mould; several varieties and colours exist. Some were filled with feathers and sealed with wax, providing an explosion of feathers when hit. However, the resulting glass fragments are reported as creating a major problem, having been swallowed by grazing animals. To avoid this, they would often be used over rivers or lakes and many of those missed balls can still be found in the bottom of the rivers. The diamond pattern of the balls was to help them break and prevent the shot from bouncing off them. All the known balls had the text N.B. GLASSWORKS PERTH embossed around their middle  on some, certain letters are reversed or inverted. Some balls have a flat base and others a rounded base. Target balls are now highly collected by the hunting community, along with the various contraptions designed to fire them. (It is likely that a trap was made by Moncrieff’s but so far none have yet been identified.) Balls made by Moncrieff’s are amongst the most common (owing to finds of several barrels of unused balls), but in 2005 they still fetch from €80 to €200 each! Colin Mayor, Managing Director of Moncrieff’s, was given a target ball by a diver who had been working on the construction of the Jubilee Bridge (1977) as part of the reconstruction of the A9 Perth-Inverness road that crosses the River Tay, just North of Dunkeld. The diver in question visited Moncrieff’s works with a box containing about 40 target balls that he had recovered from the riverbed, including green, yellow/amber, and cobalt blue examples. He had only been working in an area of some two hundred yards either side of the bridge, but had still recovered about 40 complete balls. It would seem reasonable to conclude that the river still contains hundreds of them. Not a great deal is known about the Monish glass machines. On the basis of notes provided by Colin Mayor, it is known that they were designed by an American named MacNish. It is said that he was brought in to Moncrieff’s to specifically design machines that would compete with a French manufacturer. The machines were built at the St. Catherine’s Road plant and most parts were made in-house in the factory’s engineering department. Only those parts that could not be made in the Machine shop were bought in from another supplier. Up until the time of its closure in 1996, the company still had complete sets of drawings. The last spares sold were the actuator spool valves for the ‘Minor’ machine, ordered by a South American company in the mid-1960’s. The Monish machines were the first fully automatic glass-blowing machines built in the United Kingdom. However, they were soon displaced by the I.S.† type of machine which had a much higher output. Today, the I.S. machine is the most common type of machine used for container production throughout the world. They have greatly improved control systems and a single section can produce in excess of 200 containers per minute, compared with the numbers shown in the Monish machines page. † I.S. Machine is an abbreviation for Individual Section Machine. One or more sections of the machine can be stopped for maintenance while the remaining sections continue in production. Early in Moncrieff’s history, ink manufacture accounted for a high proportion of the factory’s output, and indeed was quite as important as glass manufacture. Ink bottles were produced ‘in house’ but when the Monish machines went into production there must have been an excess of containers, because they started bottling castor oil, hair oil (macasser) and a number of other non-food items, including ammonia. More info on the ink to follow. It is likely that the making of paperweights at Moncrieff’s began in the spirit of making “friggers”. These were the creations of glassblowers experimenting in their spare time, for the fun of it. It was not only Paul Ysart who made paperweights, but his were the only ones that were produced officially and sold under the Monart trademark. Colin Mayor recalls that Frank Eisner occasionally went into the factory on a Saturday morning to make ‘weights’ with some of the other glassblowers. However, he was somewhat frail and was only able to set up the flower patterns; the glassblowers would then complete the work to Frank’s instructions. The weights were not of good quality, often being cracked. Moncrieff’s was no longer melting crystal and the only clear glass available was either Monax or MS1, neither of which would have had a suitable expansion co-efficient for the colours. Swans were also made at Moncrieff’s, originating from a style and technique developed by Bernard Wade, who was the melting department foreman. (Formerly of Wood Brothers, Barnsley.) The method of making swans was to drop a gather of glass onto a piece of insulation brick; using single-pointed tweezers, the beak and eyes were formed, then the neck drawn upwards and bent to shape. After this had cooled sufficiently to retain its shape, a second gather was dropped directly onto the first and the tail drawn up, followed by the wings which would have two or three indents on them. This produced a highly stylised figure of a swan with exaggerated tail and wings. Nearly everyone made or attempted to make swans, and though they all copied this technique the results were quite different looking. Today, Bernard’s swans are clearly identifiable. He always made them in sets of three – small at approx. 3", medium at 4", and large at 5½". The bases were ground and polished. The clear ones were all made of ‘Monax’, because it was easier to work. The Monax glass had a yellowish tint and the MS1 had a greenish tint. On the occasion that a colour was added to the melt for normal production, then coloured swans were made but these are extremely rare. 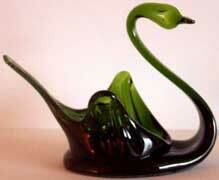 The coloured Swan shown here was made under the direction of Colin Mayor to illustrate the Moncrieff style of swan. A notable exception to the above method is the work of a glassblower from Waterford, Ireland, who made swans using a different method to form the wings. Colin Mayor recalls that a fellow engineering apprentice engraved a pair of borsella puntatas and used these when he made his swans. But they were not very popular, and he concentrated more on making fish. It has been suggested that these swans were used as handouts on school visits. However, Colin confirms that this was not the case. It is highly probable that some of the ‘sets of three’ suffered casualties and the survivors were given to anyone who was interested in acquiring them. While the full story of “Monart” artistic glass can be found elsewhere on this site, there are parts of the story that are key to the history of Moncrieff’s North British Glassworks and deserve mention here. Moncrieff’s first registered the trade mark “Monart” on September 28th 1928 and renewed it on three later occasions, the last being in 1979, nine years after it had lapsed and eighteen years after production of Monart ware had ceased. The reason for this was discussed in the local press where heated exchanges were published. Caithness Glass of Wick had announced that they were going to build a glass-blowing factory in Perth. The Board of Directors at Moncrieff’s were very upset, believing that the only reason for choosing Perth was to tap into the pool of skilled glassworkers at the Moncrieff plant. They took various actions to protect the company and one of these was the renewal of the ‘Monart’ trademark. As it transpired, they had no reason to worry; Caithness offered rates of pay that were too low to entice staff away from Moncrieff’s. As with any business, output has to be varied to suit changing technologies and economic shifts. Moncrieff’s went through many struggles before finally being liquidated in 1996. But even then its work was continued by Monax Glass, Spectraglass and, more recently, a new company called John Moncrieff Ltd.
Coffee Jugs and lids for ACI Crown Glassware Ltd. Sydney, Australia. ACI Crown Glassware was an importer and marketer of glassware. Established 1926, sold 2000. Coffee Jugs for Peter Bodum, Bramah, etc. John Moncrieff Ltd. made hand-blown &Lsquo;Santos’ coffee jugs from the 1960’s-70’s for Bodum AG. Production was then transferred to Germany where they were machine made. An entire range of coffee jugs, bowls, funnels, and drainers for ‘Cona’. A host of ‘oddball’ items not related to the ‘Scientific, engineering, and laboratory’ norm, e.g., TV turntables, washing machine doors, Aladdin lamp chimneys. In the 1960’s optical lens blanks were made (up to 2 tons/per day) and fresnel lenses for the TV stage and film industry, slowly replacing the declining laboratory ware range of product. The company also became active in the industrial lighting field, supplying to a number of companies, toughened and annealed bulkhead and well glasses. In the 1970’s some special lighthouse bulbs were supplied to Thorn, for Trinity House. On two occasions (1960’s & 70’s) special stoppers were made for commemorative whisky decanters for Dewars, but not the decanters themselves. Leaflet: Perth Glass, Perth Museum and Art Gallery 1994. Articles by Alex Kerr on Target Ball shooting (Shotgun editor of Guns and Ammo magazine). General Internet searches for referenced companies, current users and producers of gauge and other borosilicate glass. Scottish Glass, a biography of John Moncrieff (Senior) by Michael Thomas Vaughan. Published in Scottish Glass Society newsletter No 45 Autumn 1993. Berwick, Hildegarde, “Black ink, steam trains and flower vases”; article in Dirt, Dust and Development: 50 years of Perthshire Archaeology; papers given to celebrate the 50th anniversary of the Archaeological & Historical Section, Perthshire Society of Natural Science, 2000. Correspondence with Bodum AG. Switzerland. Information on production by John Moncrieff Ltd.
Jenkins Valves, Catalogue and Price List No. 22 of Jenkins Bros, Bridgeport, Connecticut. Undated but from dates in the book it is likely to be in the period 1928-1933. This provide details on H.A. Rogers. Their No. 23 catalogue was dated 1933 and the Moncrieff pages are shown on this website. The following items do not form part of this article and are kept here for general interest and future research. Whisky Bottles and Light bulbs. Some questions and answers from Colin Mayor as compiled from several discussions. Did Moncrieff’s make Whisky bottles, although probably not during John Moncrieff's Temperance period? I was not aware that Moncrieff had made whisky bottles. If they did they must have been made at the Tay Glassworks, and not the North British Glassworks, because although the Monish machines were made at North British Glassworks, all bottle blowing was carried out at the former plant. Nothing was thrown out at St. Catherine’s Road; there were a number of mould stores and they contained just about everything. As part of the engineering department, I had free access to all these secure areas and I do not recall ever seeing machine moulds. When the Tay Glass plant was closed a lot of plant equipment was moved St. Catherine’s Road, but not the machines. I can only guess that machines and moulds were sold on as a job lot. There were a number of companies bottling whisky in Perth: the biggest were Dewars, Matthew Gloag (Famous Grouse), and Bells. In my time I remember seeing ‘Perth’ on the Bell’s bottles, but of course bottles could be made anywhere and be engraved to order. 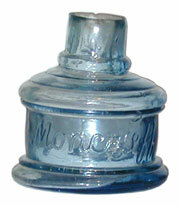 Machine made bottles usually have ‘punt’ marks on the base, showing origin and date, so it might easier to say it was not made by Moncrieff’s. On two occasions (60’s & 70’s) special stoppers were made for commemorative whisky decanters for Dewars, but not the decanters themselves. Most glass makers were involved in making envelopes for lightbulbs up to the 1920’s but after machine blowing was developed, did Moncrieff’s make light bulbs? I am not aware if lightbulbs were made during the 20’s, it is possible, it is the type of item that the company would have been interested in, and capable of producing. What did Paul Ysart do at Moncrieff's after production of Monart ceased in 1961? The official factory outlet for “Monart” glass in Perth and surrounding area was William Watson & Sons, China Merchants, 265 High Street, Perth. This company is still in business. They worked closely with Moncrieff’s and placed their own label on all pieces retailed by them. Frank Eisner, who is reputed to have made some paperweights, as friggers, did work in the glass industry but no evidence that he worked at Moncrieff has been found. However, Frank’s son, Eric, joined Moncrieff’s as Chemist, coming from GTC Glassworks in Newcastle where he had held a similar post. He filled a number of different positions within the company, including Managing Director (in 1962), until the company was taken over by Reed Building Products.